Before I start, let’s get one thing straight: Shrek was CGI perfection. If you want to know how to make a great CGI animated movie, watch Shrek (coupled with Toy Story, A Bug’s Life, or any other Pixar movie). It’s just excellent. Sadly, I can’t say that about the sequel. For the two people living in rural Kansas that missed this movie, the plot involves Shrek, Fiona, and the always hilarious Donkey heading to the kingdom of Far Far Away to meet Fiona’s parents and get her father’s blessing. At this point, the film feels like its going to be an animated version of Meet the Parents. I love Meet the Parents, so it felt like this was going to be fun. But when the characters get to Far Far Away, the movie pretty much drops any pretense of a plot. Okay, to be fair, there’s something about Fiona’s father wanting to kill Shrek because the evil Fairy Godmother wants him too because she did a favor for him years ago, and then Shrek decides, at the same time, to go become a human so Fiona will be happy and.....just watch the movie. It’s a lot simpler then me trying to explain it. 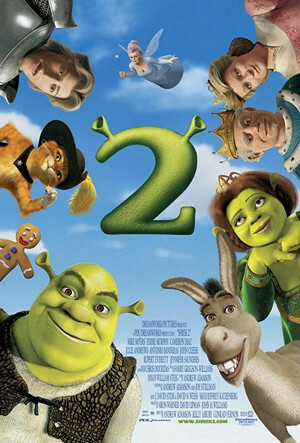 Shrek 2 is an overall solid sequel. The jokes fly by quick and funny, and only fall flat once in a while. Many of our favorite characters return, but the film has one big, glaring flaw that holds the whole movie back. The plot. The plot is simply paper-thin, and can’t be explained with one overall summary. Like I said, it’s a strong story until the Shreks get to Far Far Away, where its basically a crossover of Meet The Parents, Evil Fairy godmother Stories, and the cliché of changing into from a beast into a human. There’s no originality in this plot, and its biggest problem is not that its thin, but that it doesn’t have a plot centering around fairy tales like the first film. The original Shrek was taglined “The Greatest Fairy Tale Never Told,” and that sums the film up quite nicely. It’s all about fairy tales from the point of view of an angry Ogre, and it’s a brilliant idea. The only fairy tale plot element here is Puss in Boots, who makes this movie not only watch able, but fun. Voiced by Antonio Banderas, Puss in Boots is a sly, suave ogre assassin who has plenty of tricks up his sleeves. He’s pretty god with the ladies too. He’s hilarious to watch, and the scenes with Puss, Donkey and Shrek on screen at the same time are top-notch comedy. There’s a twist at the end that incorporates another fairy tale element, but the rest of the film lacks what made the first film fun. Shrek was very original, but Shrek 2, instead of relying on originality, relies on clichés. Not clichés from the first film, but clichés from other films. When they get to Far Far Away, all shops and such are parodies of names of shops in the real world. How many times have we seen that? Shrek and the Father have a big rivalry, and the father is reluctant to let Shrek be with his daughter. Wow, that’s new. The mother is very understanding. Yawn. The bottom line is that Shrek 2 is fun, and is an adequate follow up to the original, but it just isn’t original or fun as the first film, and it’s quite apparent. Disappointing is probably a good word to sum up Shrek 2, and I’m wondering what word I’ll sum up Shrek the Third with. I’ll be back with a review of that later this weekend, along with another flashback review, this time of Pirates of the Caribbean: Dead Man’s Chest.